Two of the Cheech & Chong: Get It Legal tour dates were canceled. No official reason was given. Cheech & Chong had a brief segment on last night's Daytime Emmys on CBS. Critics panned the show. Although, the Cheech & Chong clip was cute. Cheech & Chong have announced nine more Get It Legal tour dates. These dates go on sale this Friday, June 25th @ 4:20PM local time. Some of the dates will be added to the Live Nation and Ticketmaster pages later this week. Ticket vendor for each event listed below. Tickets available via Ticketmaster link above. Tickets available via Live Nation link above. The Cheech & Chong: Get It Legal tour is coming to the Majestic Theatre in San Antonio, TX. This is where their live tour DVD/Blu-ray, Hey Watch This was filmed. On sale: Friday, June 25, 4:20PM local time. Click on the Ticketmaster link above. The Cheech & Chong: Get It Legal tour is coming back to the Tulsa Convention Center Ballroom, in Tulsa, OK. Tickets go on sale this Friday, June 25. The Cheech & Chong: Get It Legal tour is coming to the Beacon Theatre in New York City. 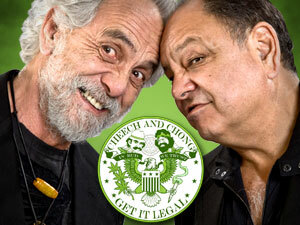 The Cheech & Chong: Get It Legal tour is coming back to the Gibson Amphitheatre in Universal City, California. Tickets go on sale this Friday, June 25. Click on the Live Nation link above. The Cheech & Chong: Get It Legal tour is coming to Richmond, British Columbia, Canada. Tickets go on sale this Thursday. On sale: Thursday, June 17, 10AM local time. Tommy Chong recently shot a commercial for Mary Jane's House of Glass in Vancouver, Washington. I don't know who talked Tommy Chong into doing this commercial. Maybe, Shelby wanted some extra shopping money. I'd understand if Tommy did this before the Cheech & Chong reunion, but to do this now is just plain embarrassing. It probably airs on public access. Tommy Chong's management is probably slamming their heads against the wall. Actress/Comedienne, Margaret Cho, has a musical comedy album named Cho Dependent coming out on August 24th. Contributors include Tegan and Sara, Andrew Bird, Brendan Benson, Rachael Yamagata, Grant Lee Phillips, Jon Brion, Fiona Apple, Ben Lee, Ani DiFranco. Track #2, Calling in Stoned, was co-written with Ben Lee/featuring Ben Lee and Tommy Chong. Margaret Cho can currently be seen on Lifetime's Drop Dead Diva.